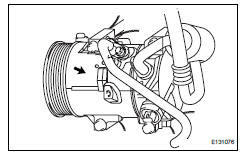 Remove the bolt and disconnect the cooler refrigerant suction hose from the cooler compressor. Remove the o-ring from the cooler refrigerant suction hose. Seal the openings of the disconnected parts using vinyl tape to prevent moisture and foreign matter from entering them. Remove the bolt and disconnect the cooler refrigerant discharge hose from the cooler compressor. Remove the o-ring from the cooler refrigerant discharge hose. W/o stud bolt: remove the 4 bolts and cooler compressor. W/ stud bolt: remove the 3 bolts, nut and cooler compressor. 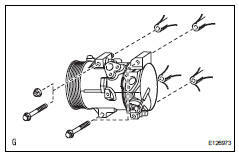 When replacing the compressor and magnetic clutch with a new one, gradually discharge the refrigerant gas from the service valve, and drain the following amount of oil from the new compressor and magnetic clutch before installation. When checking the compressor oil level, observe the precautions on the cooler removal/installation. If a new compressor and magnetic clutch is installed without removing some oil remaining in the pipes of the vehicle, the oil amount will be too large. This prevents heat exchange in the refrigerant cycle and causes refrigerant failure. 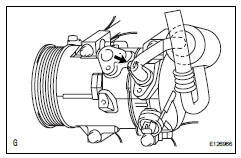 If the volume of oil remaining in the removed compressor and magnetic clutch is too small, check for oil leakage. W/o stud bolt: install the cooler compressor with the 4 bolts. 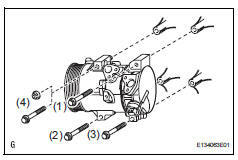 Tighten the bolts in the order shown in the illustration to install the cooler compressor. W/ stud bolt: install the cooler compressor with the 3 bolts and nut. Remove the attached vinyl tape from the hose. Sufficiently apply compressor oil to a new o-ring and the fitting surface of the cooler compressor. Install the o-ring on the cooler refrigerant discharge hose. 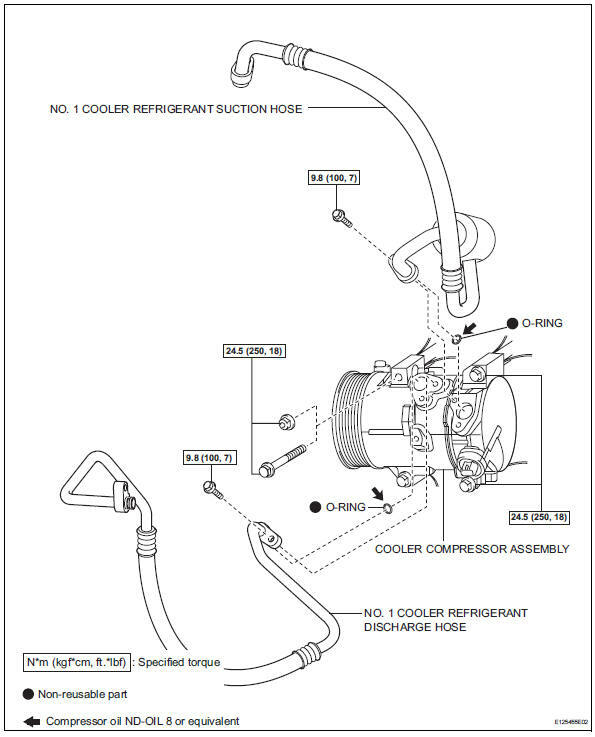 Install the cooler refrigerant discharge hose on the cooler compressor with the bolt. Install the o-ring on the cooler refrigerant suction hose. Install the cooler refrigerant suction hose on the cooler compressor with the bolt.